Looking for the perfect Valentine’s Day retreat? Chateau on the Lake Resort & Spa, a European style retreat with an unforgettable location overlooking Table Rock Lake, just outside of Branson Missouri, is offering a new romantic escape. The Chateau’s Valentine Package includes a one-night stay in a king bed guestroom, a bottle of champagne and chocolate-covered strawberries delivered in-room, four-course haute cuisine menu in the Chateau Grille, plus a Spa Chateau pineapple and pear signature fragrance gift set. This romantic escape is priced starting at $319 a night per couple (subject to availability, restrictions, and includes taxes and gratuities). For those who want to extend their stay, a 15% discount is offered for additional nights. That allows plenty of time to take in attractions and shows in Branson. Couples who enjoy this Valentine’s Package will also be eligible to win a gift certificate for a Lakefront Ambassador Suite, complete with breakfast. 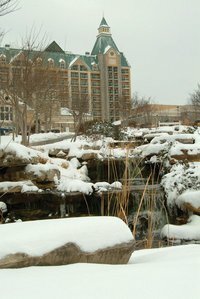 From its location on a scenic Ozark mountaintop, Branson’s only AAA Four-Diamond Hotel, Spa, and Convention Center overlooks the pristine waters of Table Rock Lake. It includes a full-service marina with jet skis and ski boats (great in spring or summer) and the indulgent new 14,000 square foot Spa Chateau (perfect for your winter getaway), where a stunning floor-to-ceiling Swarovski crystal chandelier greets guests entering the spa. Of course, romance doesn't begin or end with dinner, no matter how special and delicious, so enjoy a hand-holding moment at the 10-story atrium complete with koi pond, meandering streams and towering trees. And if you get snowed-in, who cares?